How to archive Outlook email to PDF files? 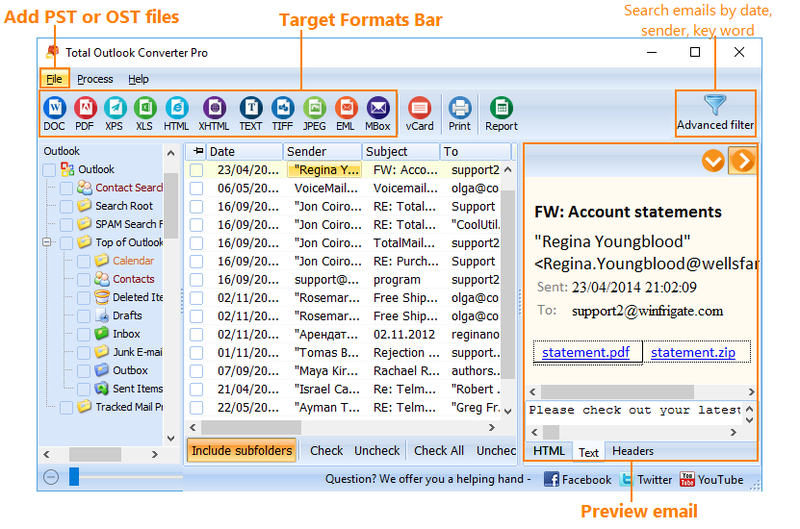 You are here: CoolUtils > Total Outlook Converter Pro > How to archive Outlook email to PDF files? PST or OST format is used for archiving emails on user's computer, updating the storage each time it connects to a mail server. What you see inside Microsoft Outlook program is the content of your storage file. To free up your mail client from old emails but not lose important information, you can convert emails from PST or OST to PDF, and then delete them from Outlook. 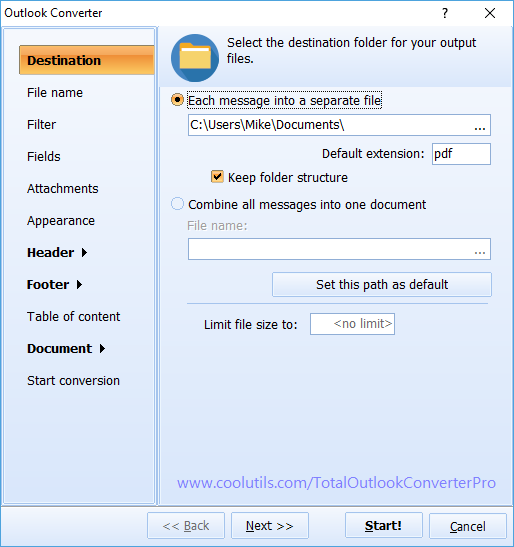 Total Outlook Converter Pro supports both PST and OST files and can convert their content into PDF, including attachments. Ability to export or save attached files from mail storage files is what differs Pro version from the standard one. Being a batch converter, it is suitable for quick and easy processing of the entire mailbox. You can combine all emails into one PDF file. This is a perfect way to make compact one-file backup. You are free to insert attached messages into a PDF mail copy. Attached emails or documents can be exported to PDF too or saved in their original formats to a folder. If you have attached archives, media files or programs, you can extract them from storage file too. Converted copies can be protected by encryption. PDF supports password protection, and Total Outlook Converter Pro allows setting two passwords for PDF copy - one with full permissions and one with limited set of permissions. The look-and-feel of PDF copies is fully adjustable too. 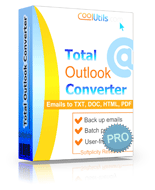 Try Total Outlook Converter Pro and see how easy bulk mail conversion can be! 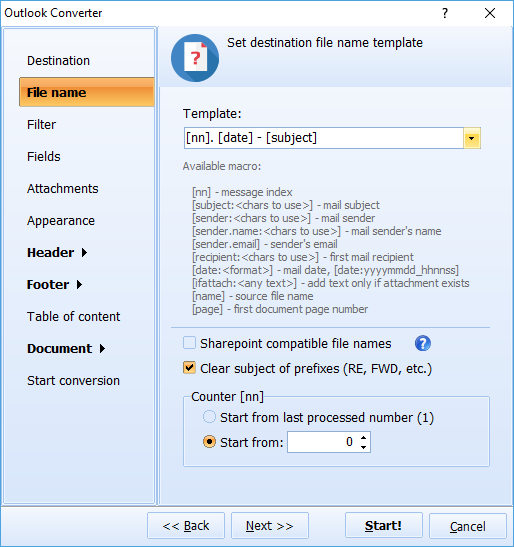 How to export all Outlook contacts to vCard files using TOC Pro? How to export Outlook Emails to HTML with attachments?